Are you ready to get real about landing your first real estate salesperson job? Real estate can be an incredibly lucrative field and offers a lot of opportunity for professional growth. There are a large variety of jobs within real estate that appeal to people with different skill sets, so no matter what background you’re coming from you’ll most likely be able to find a niche within the industry. Let’s walk through how to get a job in real estate, from completing your first education requirements to landing your first client. So you’re excited to make a career switch? Here’s what you need to get started. Securing a job as a real estate salesperson starts with education. You’ll need a license for your desired career path and that’s easiest to get by taking a pre-licensing course. A common progression is starting as an agent working for a broker, and eventually working your way up to having your own agents working underneath you. Both steps—becoming a real estate agent and upgrading to a broker—require a license. You can get this based on the requirements of the state in which you work. You can review the requirements to get started in your state as part of your initial research. Keep in mind that most of these jobs differ in both the work environment and pay depending on whether you are dealing with commercial or residential real estate. We’ll touch on that a little later. 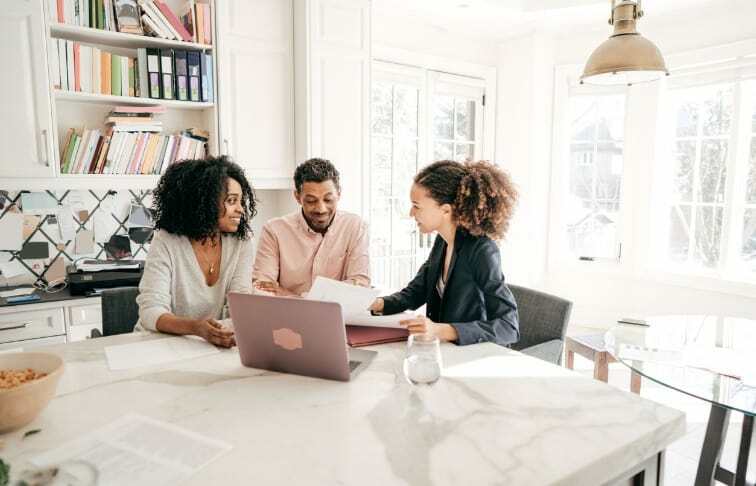 Real estate professionals require certain legal licenses on top of a base-level education, though getting these licenses can usually be done through simple training courses. Whether you are listing a one bedroom apartment in the Midwest or helping a large corporation find new office space, there are certain skills that all real estate professionals should have in their back pocket. If you shy away from numbers, you might need to brush up on your basic math skills before jumping into real estate—but don’t let that scare you away. Basic experience with math and accounting is a necessary skill for a position within real estate, whether you’re a broker or a property manager. If you’re nervous, check out these real estate study hacks to help you tackle this element of your learning. In either the sale or purchase of a property, it’s important that you know the surrounding area to consider the market when advising clients. Working in one specific area can be a strategic career move, as referrals and word of mouth accumulate after you’ve worked with multiple properties in one area. Since the real estate business is heavily based on person-to-person interaction, it does help to have people skills. From addressing clients by name, sending handwritten cards and showing up with a smile, simple personal touches can go a long way. It might sound like common sense, but personality could be the difference between landing a client and losing one. Plus, you’re always looking to score coveted referrals as a real estate agent, so impressing your clients will hopefully lead you to new clients in the future. Being on time is an easy way to impress potential clients, and gain the trust of existing ones. In the real estate business, timing is important as property visits and meetings are often a big part of real estate jobs. As we mentioned earlier, most real estate brokers begin as agents before moving to the status of a broker or into a niche field such as luxury home marketing. A broker holds more of a managerial role, as they often oversee a team of agents, using their industry knowledge and experience to advise and lead. You can start your journey by finding the right broker to work with, putting in the time and demonstrating an ability to lead. Gaining experience as an agent provides the know-how for becoming a broker down the line if that’s the path you choose to take. Most real estate positions work off commission, though they differ in whether a base salary is guaranteed on top of that commission. In many cases, a real estate job is completely based on commission, in which case you won’t be making money unless you’re selling properties. That being said, the pay is also dependent on the value of the properties you’re dealing with. For example, the commission on a million dollar home in comparison to that of a small apartment is significant, so consider what kind of market you’d be most comfortable working in before you begin your career. Since most agents work under a broker, finding the right fit is a great first step. Once you find a brokerage that appeals to you, ask which specific broker you will be working for. Research their reputation and ask if you’ll be allowed access to broker leads. This way you’ll have the chance to represent a potential client with whom the broker might have a preexisting relationship. In this day and age, if you’re not online you are missing out on opportunities. Since millennials are coming of age and getting increasingly tech-savvy, it’s important to represent yourself online as you would in person. Build a website, create social media pages including Facebook, Twitter and Instagram and post fabulous photos regularly. Don’t have much to say yet? Post about yourself! Allowing clients to get to know you online is an efficient and modern way to make connections. Pick an area where you would like to focus your work and learn everything there is to know about it. Drive around, talk to homeowners, hand out business cards and even go to an open house or two—it’ll all help when it’s your turn to take the wheel. When you do connect with a potential client in the area, you’ll have a solid understanding of what their options are for their specific needs. Now that you know everything about landing your first real estate salesperson job, it’s time to get moving. Your career as a future real estate mogul is just waiting to unfold.